The previous post (which I just made public today) is funny for me to read, for two reasons: 1) I had no idea what nausea and sickness was at that time, because it got a whole lot worse and 2) I was nowhere near 7-8 weeks, I was 5 weeks, 6 days. A little off there, Michelle. Now, here we are 6 weeks later. Over the past several weeks, I have been to the doctor twice, thrown up so much I broke blood vessels in my eye and capillaries all over my cheeks, lost weight (and then found it again), announced the happy news to the world, and officially started showing! It’s been a roller coaster ride of emotions, sickness, and exhaustion. But mainly, pure elation. We are now 1/3 of the way done with the pregnancy and beyond excited for the rest of this journey and to meet our little one in just 6 months. How far along? 11 weeks, 6 days. How big is the peanut? About 2 1/2 inches, the size of a large plum. Total weight gain/loss? About 2-3 lbs. Maternity clothes? As of Monday! Sleep? At least 8 hours a night, usually a nap around 3 every day, when the exhaustion hits. Best moment this week? The bump! I am so excited to finally look pregnant and I can’t keep touching my belly, it’s so strange and wonderful. Symptoms? Exhaustion, random bouts of nausea throughout the day but they pass (unlike weeks 6-11), breast tenderness, indigestion and a roller coaster of emotions. Food cravings? French fries, Chili’s Molten chocolate cake, and fresh fruit. Food aversions? Anything that smells bad. Nothing comes to mind right now, but I know it when I smell it. Gender? Eager to find out! What I miss? Taking scalding hot baths, but really I’m okay. What I’m looking forward to? My belly getting bigger, hearing the heartbeat tomorrow and finding out the gender. Milestones? The bump! 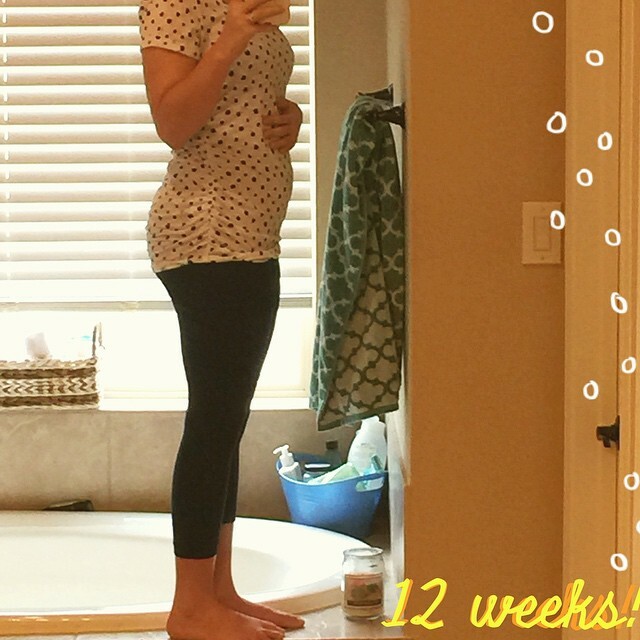 End of the first trimester! That’s all for now! Will post again soon.